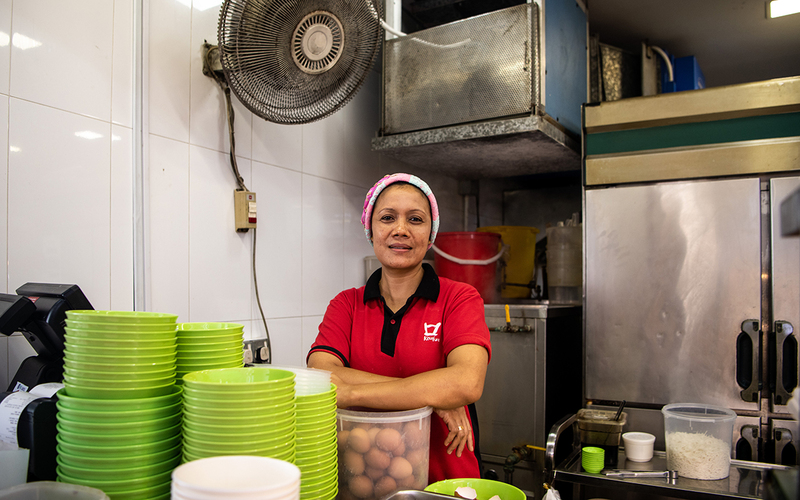 Lilis Suryani 38, helps to man Koufu’s handmade noodles store as a stall assistant. She serves about 50 to 60 bowls of noodles a day during the semester break, a far cry from the 400 bowls she is used to serving on a normal school day. To her, however, despite the reduced income, she still enjoys coming to work. “People still need to eat. As long as there are customers, I still enjoy coming to work and cooking for people,” she said. . When finals are completed and the semester ends, the campus may seem quiet. But there are still some in the NTU community who work hard during the break to keep the campus running. Photo Editor Theodore Lim walks around campus to find out who these people are. The semester break is a time of rest for many, with students moving out of school to be with family, travel and enjoy a well-earned break. But this is not the case for many of NTU’s full-time staff who continue to perform the services necessary to keep the campus running during this period. From stall vendors and cleaners to maintenance workers and administrative staff, many work through the school holidays, ensuring that the NTU campus experience remains undisrupted and that facilities are kept in good working order. Several undergraduate students also choose to remain in school, either as research assistants or as helpers and leaders for community engagement camps. Even though lecture theatres and classrooms are not used as much during the break, the maintenance of air-conditioning systems for these places continue, following a regular schedule. 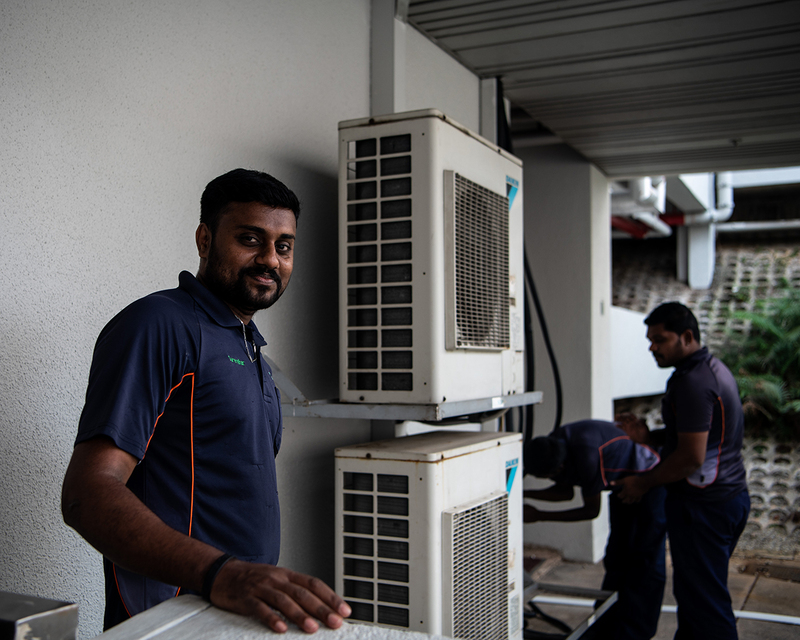 Maintenance worker Surendar, who gave only his first name, works from 7.30am to 7.30pm replacing old air conditioning units and performing routine maintenance work. “Work is work. Even if students aren’t working, I have to work too. (But) I don’t really mind,” the 29-year-old said. 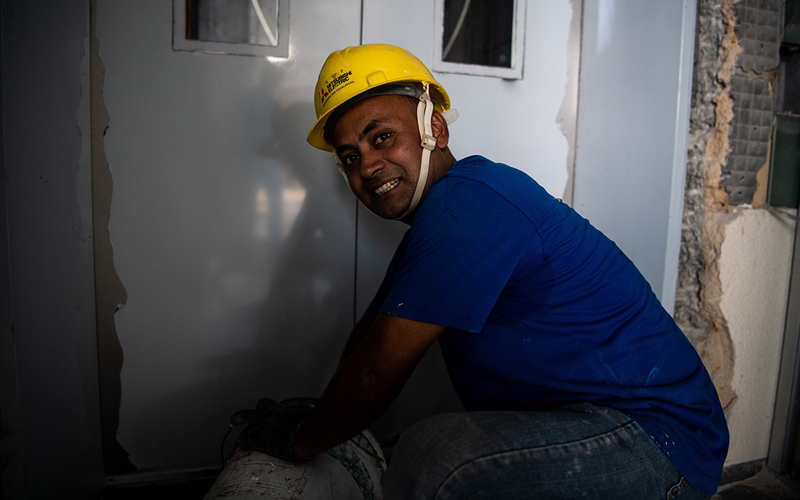 Construction worker Sukur, who gave only his first name, is one of the many workers who work hard to upgrade facilities — like the lifts on campus — before the new semester begins. The break, which is a little over a month long, is a tight time frame for such work, giving the workers a greater sense of urgency. “I don’t like (working) overtime, but the facilities need to be ready by the new year,” the 40-year-old said. Senior technology executive Ooi Cheong, or Uncle Allan as he is affectionately called by students, is part of the team that runs the Media Resource Booking Service in WKWSCI. Even though few students need to loan equipment during the break, Mr Ooi still helps to keep the service available for those working on their final-year projects. “Not many students are in school, but those that are usually need our services. We do important work for the students, and I really enjoy it,” said the 50-year-old. Some students, like Nanyang Business School student Tay Yi Qin, 23, choose to stay in school and volunteer for community engagement programmes. 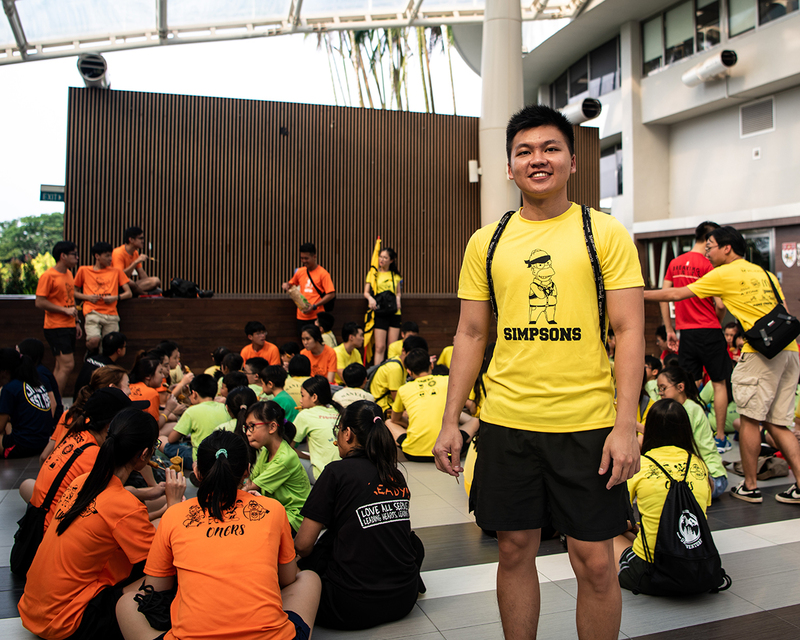 The third-year student is a group leader for Hall 1’s community engagement programme Uniqkidz, which engages underprivileged children in a four-day camp. The camp is a year-long effort, and Tay is glad to be a part of it. “I think what we’re doing with this camp is really helping children, so I decided to take time out of my semester break to come back and do things for a greater cause,” he said. The holiday break also sees NTU’s crew of dedicated cleaners and workers remaining on duty to keep the school clean and tidy, despite the lack of student activity on campus. To worker Ong Kee Chin, 66, the semester break represents a period of spring cleaning for him. 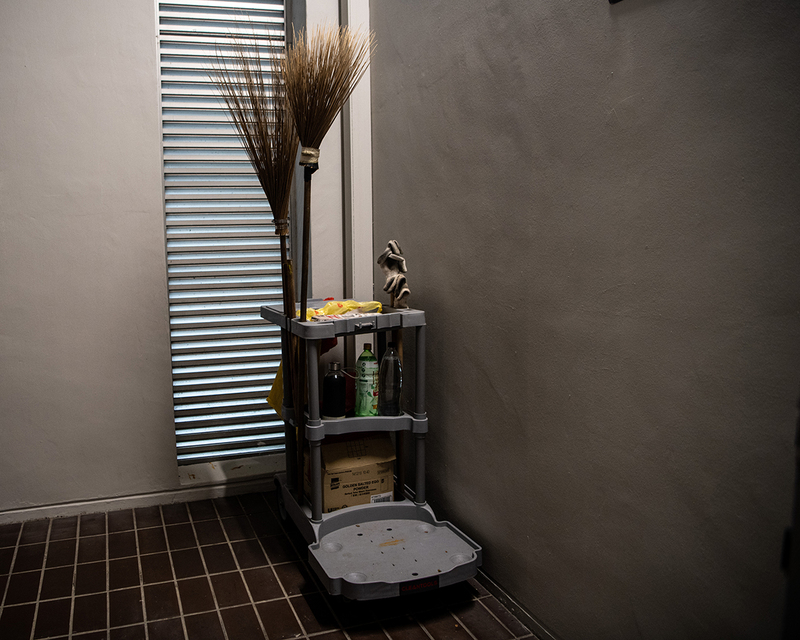 “There are fewer students on campus now, so it’s easier for me to do a better cleaning job,” said Mr Ong.